First, let me assure you that not all of my Life Philosophies are derived from the Sunday comics. That being said, I admit that Funky Winkerbean changed my life. Anyway, back in the high school days of the comic strip, Les asked one of the plainer girls for a date. She was very surprised he asked her, and she said so. He explained that he hadn’t had any luck asking out the popular girls and so decided that he should lower his standards. While this didn’t exactly win over the girl, it won me over. I’ve been setting my goals pretty low ever since. It works so much better than failure. This is why I was able to return the beginner’s Yoga class, despite my considerable ego. For a couple of weeks I tried to graduate to the advanced class, but then I reminded myself that my goal was never to touch my feet to the back of my head in Bow. My goal was to be able to get up off the floor after Corpse. Do I need a higher goal after ten years of Yoga? Maybe. Aspiration is a good thing. So I have decided that this year, my goal will be to stand on one foot. If I can stand on one foot, I can do Tree. I can do Eagle, Crane, and Warrior III. That will be good. That it will have taken me eleven years to stand on one foot just goes to show you how patient I am. Which is an admirable Yoga goal. The risk of low ambitions is that you still might not exactly achieve them, and that could be a little embarrassing. I was reminded of this a few days ago, during lunch with some friends. One of my friends is an avid music fan, and he was speaking of Keith Richards’ autobiography. According to Richards, Marianne Faithfull was so crazy that Mick Jagger finally had to call it quits. Just think about that. How sane are you if you are not sane enough for The Rolling Stones? And here is the clincher – the epitome of underachieving: Two of my lunch-mates were reminiscing about their high school buddies. One of their friends back then had always wanted to become a clown. And she had applied to Clown College. But she had not been accepted. That’s a pretty low threshold to miss. I was in marching band in high school and Funky Winkerbean almost made it seem acceptable. I forgot about the BAND! Rejected from clown college. Did she apply to any safety schools, or did she put all of her eggs in the one basket? From what I understand, she became a freelance clown. Birthday parties, I guess, where you don’t have to show your degree. Great post Nancy though I guess I don’t get the same Sunday comics as you do since I never heard of that character. I remember my kids coming home from school with a 68 or something like that in a test. When I admonished her, she said but so and so failed and this person only got 58. I said to her, do not align yourself with the failures, but stand beside the ones who are getting 80’s and 90’s. Then tell me how you did! I tried to teach them to set higher standards for themselves. But as for you, you are doing great…….think of the millions and millions of people your age who cannot do any yoga! You are just fine!! Picking those things where lower expectations make sense is only right. There are days when getting out of bed is the best I can hope for, that is my highest achievement! If I also make the bed I am ahead of the game. Yoga? I think you showing up for class is incredible, I only read they are having one and run for the nearest Starbucks in fear. Just getting to any yoga class for 10 years is a huge accomplishment! I can’t do it either. In one class, an overachiever told me to visualize myself doing it and I would succeed, just like she visualized giving birth while she did it. (Like the kid wasn’t going to come out at some point anyway.) Instead, I must have visualized myself falling sideways and knocking down the line of people next to me like dominoes. A year or so ago, my doctor suggested I might want to consider taking up yoga for flexibility. So that’s what I’ve been doing. Considering it. Good for you for actually doing it! And for 10 years, no less. Oh wow. Now I have so many questions about clown college prerequisites – even more than I did before reading this post. Can she do a guest post on the topic? Please? It has been about thirty-five years, but I hear she is still sensitive on the topic. Hilarious! I just love your writing style and dry wit. Glad you don’t get all your “Life Philosophies” from the Sunday comics though! Keep em coming. Your blog is truly refreshing. I tried Tai Chi for about a year and a half and I must confess I quit at the first opportunity because I couldn’t stand moving so slowly. Some days I just wanted to scream because I wanted to rev it up a LOT. Of course that’s not what Tai Chi is about. The only time I can slow down is when I’m reading. Good for you for being so loyal to Yoga and to yourself. Great post! I had several Funky Winkerbean comics taped inside my locker. It was a subtle comic strip that managed to hit its target more often than not. Ouch! Rejected from Clown College. Is there a clown community college she could attend for remedial courses? They might hold classes in a really small car. Unlicensed clowns are a drain on society. Just watch – it will be a hot topic with this being an election year and all. Especially if they take jobs away from Clowns who still have their student-clown loans to pay. Wow, I haven’t heard the name Funky Winkerbean in years. I remember loving that cartoon, but not much more than that. Now I’m going to have to google it. As an avid underachiever myself, let me tell you that you have surpassed yourself with this humorous post, for whatever that’s worth. In case that came out all wrong…Great Post! Ouch! Wonder if she ever pursued her dream of clowning without the degree. LOL! I wanted to be a rodeo clown. I have raised my standards…now I want to be a, well, come see. I have something else to show you, anyway…. Several years ago my husband had a stroke. During his recovery he made it to the rehab floor of the hospital where he had to be able to stand on one foot before they would release him from hospital. He was able to do it within days and is still doing well! So keep trying! 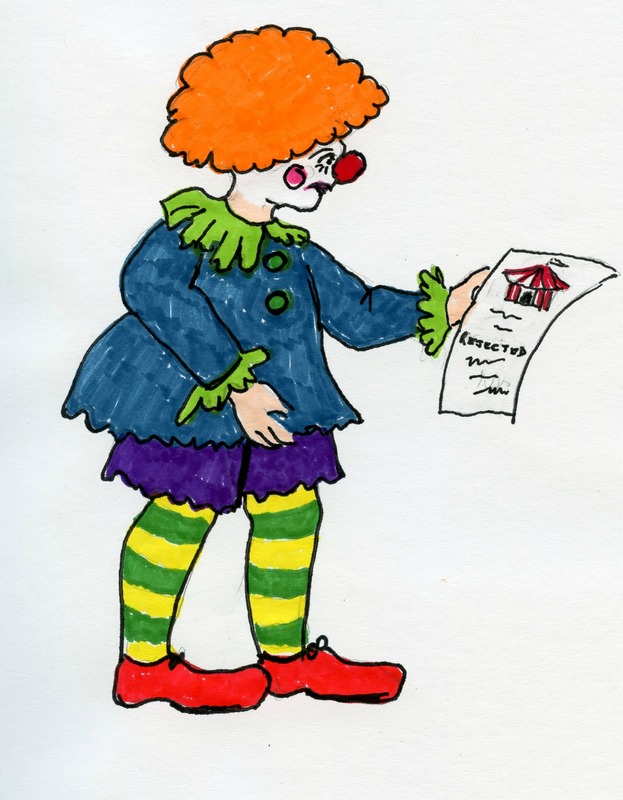 I think if I was rejected from clown college I’d go the exact opposite route and become a tax attorney.